This Sunday, the 4th of February, we’ll be hosting the first ever Guild Ball Playtest event. If you missed our original announcement for this event, or if you want to buy a ticket to attend, you can find all that information HERE. Today we’re going to do a quick recap of what’s going to happen, and maybe even give a few sneaky hints at what the attendees will get to playtest! 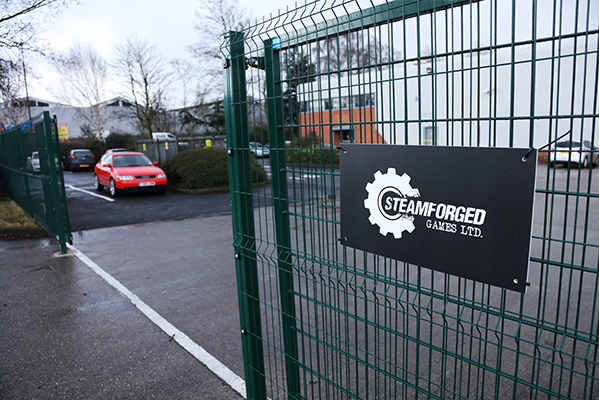 Our address is Unit 1, Kestrel Road, Trafford Park, Manchester, M17 1SF. There is ample parking available for those of you planning on driving. Our staff will be onsite from just before 9am to open the doors for you. Once inside we will ask you to switch off all mobile phones and recording devices. These will then be placed in our secure lockbox until the end of the day. Remember that no recording of any kind is permitted at our playtest events! For those needing to give emergency contact details to any friends or relatives, our staff will have an emergency contact phone on them, the number is 07487 250674. Each attendee will then be asked to sign a non-disclosure agreement (NDA). Because these events are about testing models that are unfinished, all attendees must sign an NDA before being allowed to see any of the playtest rules or models. After you have signed the NDA, you are not allowed to discuss any unreleased rules or models until they have been shown to the public by Steamforged Games. So no going home and posting everything you found out on a forum, blog, or social media! Next, you’ll be taken on a short tour of our HQ building. Those with keen eyes may be able to spot some samples of unreleased model sculpts belonging to our various games. In general, we just want to give you a little insight into what it’s like working at Steamforged Games. Finally, we will return to our events room where members of our development team will give you a crash course in Guild Ball playtesting followed by a rundown of the models and rules you’ll get to play with! Remember that attendees should bring their own miniatures, dice, measuring tools, and any other gaming accessories they want to use during the day. There will be something new for everyone to play with regardless of what Guild you bring, however, if you want to narrow down your choice, it might be a good idea to bring your Butchers, Brewers, Engineers, Farmers, Hunters, Morticians, or Union teams. At about 10am the first games should start, and we can get on with having an awesome day with brand new toys! Also, our on-site store will be open on the day with Blacksmith Guild: Master Crafted Arsenal available to buy.